Homemade blood orange donuts are a real treat any day of the week. But add in brown sugar bourbon glaze and oh boy, you're in for something special. Sweet, citrusy and full of booze flavor, you don't want another weekend to go by without enjoying these donuts. There are some donuts you'll probably never be able to find in your local donut shop. 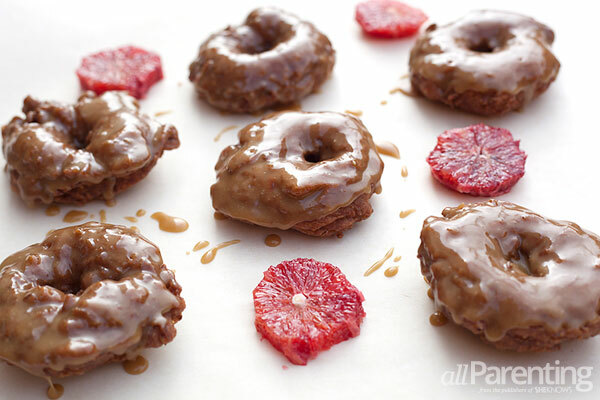 These blood orange donuts with brown sugar bourbon glaze included. These delicious treats start out as old fashioned sour cream donuts. The addition of blood orange zest and fruit transforms them into something even better. The brown sugar bourbon glaze on top — now that's the real icing on the cake. It brings a level of sweetness mixed with booze that's unforgettable. But don't take our word for it. Try these blood orange donuts out for yourself. You'll be very happy you did. In a small bowl, combine flour, baking soda, cinnamon, nutmeg and salt. Set aside. In a large bowl or electric stand mixer, add sugar, sour cream, egg, blood orange zest and segments and unsalted butter. Mix to combine. Slowly add the flour mixture to the wet mixture while continuing to mix, until the flour is fully incorporated. Scrape the sides of the bowl as needed. 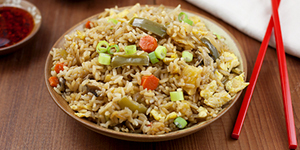 Heat at least 2 inches of vegetable oil in a heavy-bottomed pot or skillet until the temperature reaches 360 degrees F.
Roll out the dough on a lightly floured surface to about 1/2-inch thick. Using a round cookie cutter or a doughnut cutter, cut out 3-inch circles with 1-inch holes in the middle. If you don't have either of these cutters, use a small knife and carefully cut 3-inch round circles out of the dough and use your fingers to create a hole in the center of the donuts. Carefully place the donuts in the frying pan. Fry for about 2 minutes on each side, or until lightly brown. Remove with a slotted spoon or tongs and place on a baking rack covered with a paper towel. Break open 1 donut after cooking to make sure that they are completely cooked on the inside. Let cool for a few minutes before dipping in the brown sugar bourbon glaze. 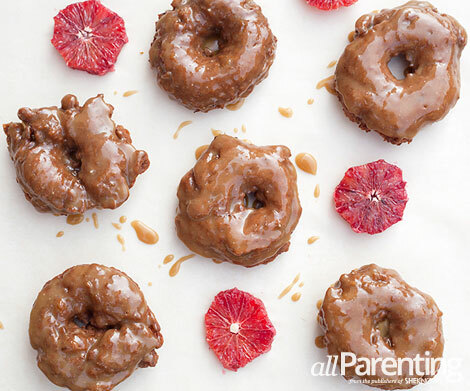 Enjoy glazed blood orange donuts immediately. Store leftover unglazed donuts in an airtight container. Note^ To segment the blood oranges, cut off 1/2 inch of each end of the fruit. Using a sharp paring knife, carefully cut away the outer rind and pith from the blood orange. Using the knife or your fingers, carefully peel away the membrane of the orange from the pulp. Add the pulp to the mixer and discard the membranes. Heat butter, brown sugar, bourbon and flaky sea salt in a medium saucepan over medium heat. Stir frequently until butter is melted and ingredients are fully incorporated. Add in the heavy cream and bring to a boil while stirring. Remove from heat and whisk in the powdered sugar. Do this 1/4 cup at a time to prevent the powdered sugar from clumping. Whisk until smooth. Pour the brown sugar bourbon glaze into a bowl that is wide enough to dip the donuts in and let it sit for a few minutes to cool. Store leftover glaze in the refrigerator.